I can't remember the last time I was so addicted to a cookie. 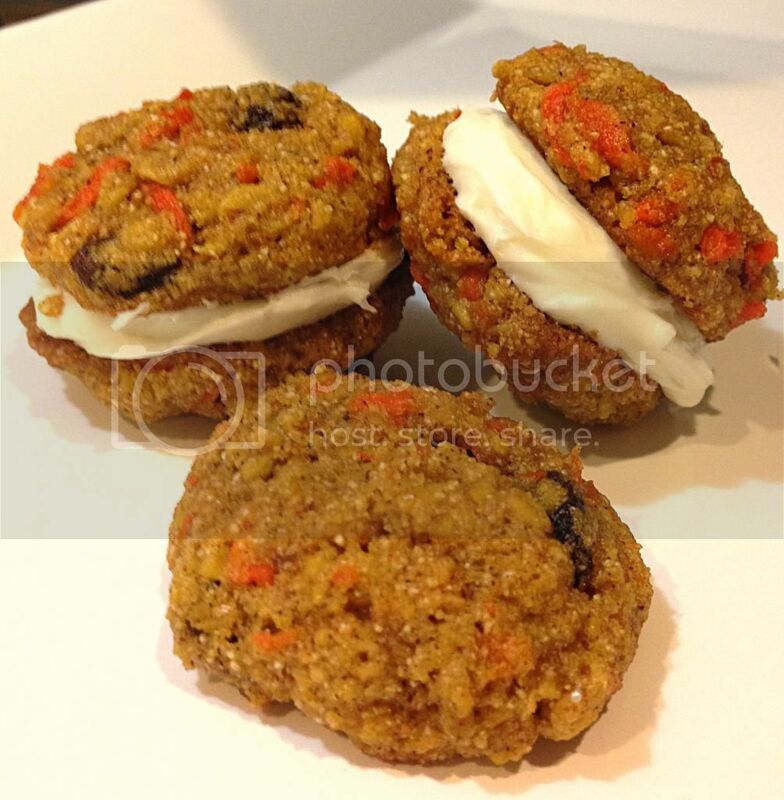 Alone, these carrot cake cookies are great, but when you add the cream cheese frosting it just goes over the top!! This makes A TON of frosting. You can probably cut in half. Line two baking sheets with parchment paper, silpats, or simply spray with cooking spray. In a mixer, beat butter and sugars on medium speed until light and fluffy (about 3 – 4 minutes in a stand mixer). Add eggs and vanilla and beat on medium until well combined. In a separate bowl, sift together flour, baking soda, baking powder, salt, cinnamon, nutmeg, and ginger - whisk to combine. Gradually add flour mixture to butter mixture; mix on low until just combined. Do not overmix. Mix in oats, carrots, raisins, and walnuts. Shape tablespoons of dough into balls and place on prepared baking sheets, spacing 2 inches apart. Bake until browned and crisp around the edges, 12 to 15 minutes rotating halfway through. Combine butter and cream cheese in mixing bowl and mix on medium speed for 5 minutes. While mixing at a low speed, add sugar. Once combined, add a splash of vanilla extract and mix on a medium to high speed for 3 minutes, or until smooth and fully combined. Frost half the cookies and top with the other half to make the sandwich! I very regrettably tossed the extra frosting and afterwards a friend of mine told me of a great use for the extra frosting......graham crackers! If you're brave enough to keep the extra frosting around the house, you can spread it on graham crackers as another sweet snack.